"I have a problem keeping track of pencils in my house probably because a certain toddler loves to pull out the eraser and chew on it while he dumps the lead and breaks them all one by one. So whenever I need one for pattern drafting they are so hard to find! I don’t mind sharing most things, but toddlers shouldn’t be playing with mechanical pencils anyways. 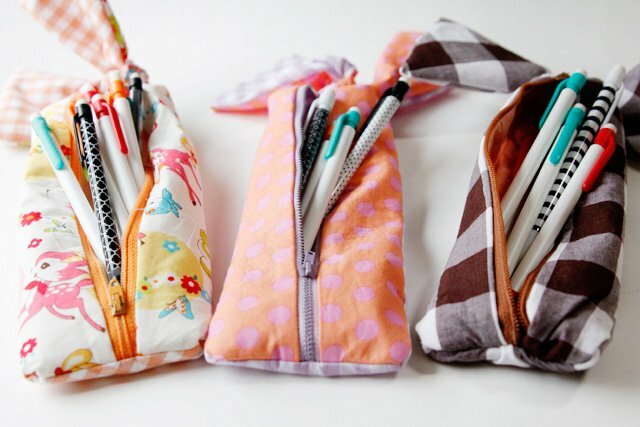 "I made these cute pencil cases as an easy solution. 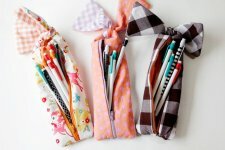 First, they are the perfect size for mechanical pencils, I’m sure regular pencils or colored pencils would fit, too. Now I can stash all my pencils in the same place. "This is a basic zipper pencil pouch tutorial but the pattern is a super weird shape to account for the cute bow knots at the top and/or bottom."